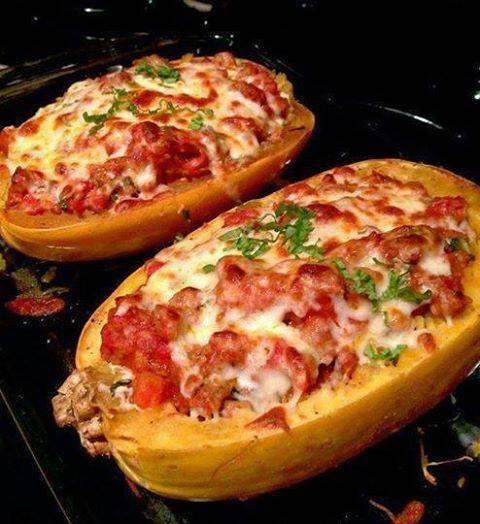 If you’ve never experienced the magic that is spaghetti squash, this is the recipe to kick off your new fall obsession. It’s called spaghetti squash for a reason, after all, and these tender strands of squash make a remarkable stand-in for our favorite pasta dishes. Today, this mild-tasting squash is getting a lasagna makeover. Mozzarella, ricotta, meat sauce — the works. It’s a bowl of hot-baked goodness that you get all to yourself, no sharing required. Brush with oil, season with salt and pepper, and place in baking dish (9 × 13 works well) with a little water in the bottom of the dish — as the squash cooks, you can add more water if it dries up. Roast for 45-60 minutes, depending on squash size, or until inside is soft and easily “fluffs” with a fork. It will look like very tiny spaghetti noodles… hence the name, cool huh? *While squash is roasting, brown Italian sausage in large skillet over medium heat. *Remove sausage from the pan drain and set aside. *Add sauce to the pan and simmer. *Add the sausage back into the sauce. *In a bowl, combine the ricotta, mozzarella, and fresh basil, set aside. *When squash is tender, remove from oven and using a fork, scoop, fluff, flake, scrape, whatever you’d like to call it, to get the inside of the squash to look like spaghetti noodles. *You don’t have to get at ALL of the squash, you can scoop more later when you get to the bottom after it’s been filled and you’re enjoying it for dinner. *Now FILL THEM! Start with a scoop of the red sauce, followed by a layer of the cheese mixture, (you can add extra mozzarella on each layer too!) and repeat the layers until you’ve over filled your squash, ending with a layer of red sauce and then topping them with mozzarella. Totally over fill these suckers.